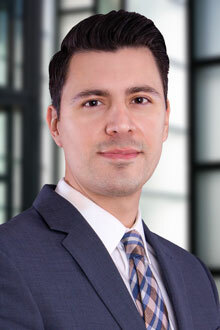 Alex Caraveo is a partner in the Dallas office of Lewis Brisbois and a member of the General Liability Practice. Alex has a broad litigation background, with a focus on insurance coverage, indemnity, catastrophic personal injury, product liability, and first party commercial and personal lines. He received his BS in biology from Southern Methodist University and his JD from Southern Methodist University, Dedman School of Law. While obtaining his law degree, he was a member of the Hispanic National Bar Association Moot Court Team, served as a judicial intern for the 101st District Court in Dallas, Texas, and was a fellow at the W.W. Caruth Jr. Child Advocacy Clinic. In addition, he received numerous awards, including the title of National Champion and Second Best Brief in 2005 and Third Best Oral Advocate in 2006. Prior to joining Lewis Brisbois, Mr. Caraveo worked for two prominent firms in Los Angeles, where he tried three cases to completion as lead and sole counsel. Mr. Caraveo is a registered patent attorney with the United States Patent and Trademark Office and is a member of the Mexican American Bar Association. He is admitted to the State Bars of California and Texas.